Manager’s Agenda #10. A communication transmitted from Louis A. DePasquale, City Manager, relative to Awaiting Report Item Number 18-33, regarding a report on whether or not Chapter 4.25 of the Cambridge Zoning Ordinance applies to the Inman Square redesign project and therefore whether or not a report should be made to the Planning Board. And the train keeps a rollin’. Every week it’s another proposal to transfer private property to public or quasi-public ownership. Is this really the ideal "vision" for the future? Will such acquisitions be uniform across the city or concentrated in just some neighborhoods? For you newcomers, Joseph A. DeGuglielmo, better known as "Joe DeGug", began his public career in 1938 as Assistant City Solicitor of Cambridge. 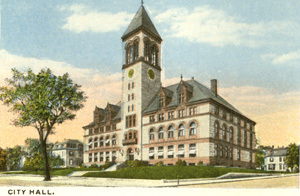 He first ran and was elected to the Cambridge City Council in 1945 and served 8 consecutive terms (1946-1963). He was elected every time he was a candidate and was chosen by his colleagues as Mayor for the 1952-53 term. Two years after leaving the City Council he was hired as City Manager in February 1966 and served through January 1968. In 1971, he was appointed an associate justice of the Boston Municipal Court by Governor Francis Sargent. He retired from the bench in 1978. He died in May 1983. His nephew is Jimmy Tingle – comic and now candidate for Lt. Governor of Massachusetts. This is a good intention that needs amendment. Property owners should not be required to inform the City the moment a storefront becomes vacant or be made to instantly submit future plans for tenancy. Perhaps the City Council could establish a time frame after which these steps might be required – somewhere between a few months and Gerald Chan time. But they are letting women drive! Isn’t that generous? Seriously, if we’re going to single out repressive regimes that use religion and/or ideology to justify brutal repression, then let’s start a list. It won’t be a short list. This a completely reasonable Order, but ultimately the only way to preserve space for uses such as these is through ownership of the building. Begging for handouts from the City is not a solution. Haven’t we produced a few nationally known artists who wouldn’t mind being seen as heroes by swooping in, buying and outfitting a building or buildings for this purpose? Where are you Matt Damon and Ben Affleck and Casey Affleck? Wasn’t this your neighborhood? Maybe you guys can assemble a team. Give Mindy Kaling and John Malkovich and Sam Waterston and Jane Curtin a call. Maybe Lenny Clarke can pitch in a few bucks. What the heck is a “sexual misconduct climate survey”? My assumption is that it’s an effort to measure the extent of sexual misconduct at universities without necessarily identifying who the bad players are or were. I have worked at several universities and virtually all of this information was the subject of anecdote and rumor. That’s never a good starting point for a discussion. I remember when Wellesley College really struggled with these questions quite a few years ago. They took a very nuanced view in light of the fact that there were some well-respected married couples whose relationship began when one was a professor and the other a student. This falls under the category of “what is appropriate” as compared to what might constitute sexual assault.